Our family loves to read so we were thrilled to review a book from Greene Bark Press. Greene Bark Press is a family-owned publishing company in Pennsylvania. The publisher feels that even in an age when the internet is widely used and technology is the norm, reading the written word in the form of books is still very important for development, especially for young children. They publish books for all age levels as well as sell toys and even coloring books. Greene Park Press also carries various games and puzzles. 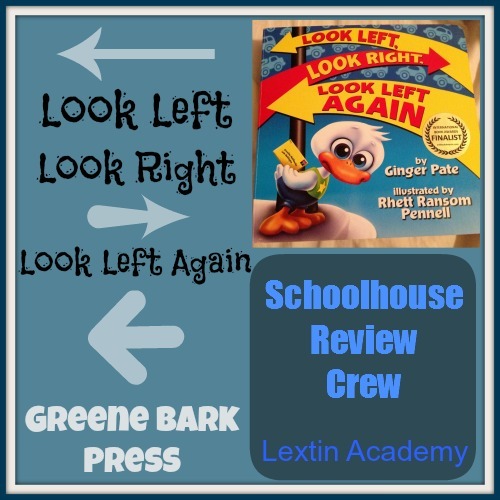 We received a copy of the book Look Left, Look Right, Look Left Again by Ginger Pate. This board book teaches the concept of looking both ways (and then left again) to check for cars before crossing the street. The storyline is about a young duck who is being taught the correct way to cross the street by his mother. At the end of the story, the duck has demonstrated that he is able to cross the street by himself in order to go visit his grandmother. This is a board book that is geared for children between the ages of 3-8 and retails for $8.50. I began by reading this book with Ladybug who is 2 1/2. She loves board books and enjoyed the bright, colorful pictures – and especially the cute duck character. While she didn’t fully grasp the concepts presented in the book, she enjoyed reading it over and over and she did understand that she needed to look for cars when we were crossing the street. Bee (age 4) and Tiger (age 5) also wanted in on the reading time. They sat with me as I read to Ladybug. They both enjoyed the story and understood the concept of looking both ways and then looking left one last time before crossing the street. Curly (age 7) read the book to everyone several times as well. After everyone had heard the book a few times, we had some excellent conversations about traffic safety that were sparked by the book. And my kids are much more cautious about crossing the street in our neighborhood. This book might be a hard sell to an older child – like a 7-8 year old who feels too old to read a board book. While the concepts are still applicable and important for this age-group to learn, the format might make it difficult to interest a slightly older child. I was able to ensure that Curly read the book by asking her to read it to her younger siblings. The pictures are colorful and interesting. My kids enjoyed looking at them and Ladybug especially enjoyed pointing out details from each picture. All the characters are animals. My kids love reading books in which animals are personified! The book uses some sound words throughout the story such as “thump thump” for the ball bouncing or “zoom zoom” for the cars. My preschool-aged kids love books that have sound words for noises. The concept is introduced through a rhyme – “Look left, look right, make sure the cars are out of sight. Remember then: look left again.” My kids have internalized this rhyme and repeated it over and over and over again. Because it rhymes it was very simple for them to remember the concept and they have not forgotten what they learned from the book. All of my kids enjoyed this cute and colorful picture book with an important message. While they enjoyed the story and the characters, they also learned the concept being taught and were able to remember it because it was set to rhyme and it was repeated multiple times throughout the book. I found that this book started multiple conversations about traffic safety that went beyond just crossing the street. I felt it was a wonderful and fun way to introduce an important concept. Read other reviews from the Review Crew here! ← It’s a Birthday Day!